Plot: Juliet, Naked is the story of Annie (the long-suffering girlfriend of Duncan) and her unlikely transatlantic romance with once revered, now faded, singer-songwriter, Tucker Crowe, who also happens to be the subject of Duncan's musical obsession. Starring: Rose Byrne, Ethan Hawke, Chris ODowd. distributed by Roadside Attractions «Juliet, Naked» in the US movie theaters released on August 17, 2018 and has grossed over $3 million worldwide; dvd and blu-ray release date was set for November 13, 2018. Rent from Netflix and Redbox from November 13, 2018. «Juliet, Naked» in the UK released in movie theaters on November 2, 2018. 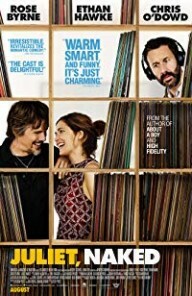 The movie released on dvd and blu-ray on March 11, 2019.